My husband and I headed off as usual to do our health food store shopping today. We just had one kid in tow - the older two stayed home. We were crossing Okanagan Lake bridge when the car...our little Festiva...that we've carefully maintained all these years...died! We hope it can be resuscitated because we're not ready to let it go yet. There's something you should know about this bridge. It's a floating bridge, has been there since the 1950s, and has three lanes with lights above so that the direction of traffic can be changed, a guy who works in an office that sits over the traffic who keeps an eye on traffic flow, and a lifting mechanism for allowing sailboats with tall masts to go underneath from the north part of the lake to the south (or vice versa). 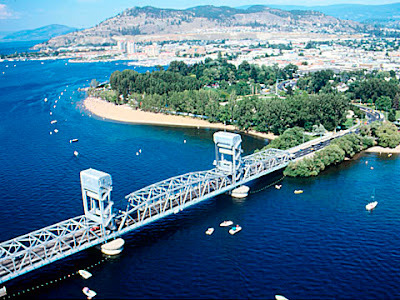 This bridge, while conveniently saving a lot of driving should you wish to travel from Westbank to Kelowna without having to go the long way around, is nevertheless a cursed bridge. Everyone who has had to regularly cross this bridge knows that they will be stuck in a bottleneck or traffic jam at some time. The outside lanes are usually open to traffic in each direction, with the centre lane being closed or open either way depending on traffic flow. An accident or breakdown on the bridge can cause tailbacks many kilometres long. Have you guessed why I'm telling you this? Yes, my little car, that was just filled with gas yesterday and was up to date on its maintenance checkups, died right in the middle of that bridge. Thankfully there were two lanes open going into town, and the guy in the office quickly closed our lane to divert the cars to the centre lane. It was a Sunday afternoon so whilst there was a constant stream of traffic it wasn't as bad as if it had been rush hour on a Monday morning! As soon as he realised what had happened, R put on the hazard lights and coasted to a stop. Almost immediately, a cyclist stopped and asked us if we wanted a push. I wound down my window and told him the problem, and that kind man, who I'd like to hug, lent me his cellphone while he got behind the car with R, and between them they pushed the car far enough that I was able to steer off the road, at the same time talking to BCAA on the phone. About 15 minutes later, the tow truck arrived (another nice man) and dropped us off at the bus station on his way to our mechanic. Our poor little car will have to sit there overnight until it can get some attention tomorrow. At the bus station, I was looking through my purse hoping for enough change to pay the bus fares for the three of us to get to the store on the other side of town. The bus was about to leave and when the driver found out why we were there, but that we didn't have the right coins to pay, he let us travel for free (yet another nice man). When we got off the bus, we were close to a bank, so we could get more cash to pay the bus fare for the trip home, and we did our shopping. We were in the right place at the right time to get a bus back to downtown and were only charged for two adults, so S got to ride home for free. Because of the Sunday schedule, we ended up having a 20 minute walk after we got off the bus, but it was a sunny day, and though the temperature was only about 3 degrees, it felt warmer. Just as well, as we hadn't dressed particularly warmly, not expecting this drastic change of plans. It's funny that I found myself at the bus station with only a fleece, no coat or gloves or hat, and I'm the one who always tells the kids, "Take your warm stuff, even if you don't wear it, you never know what might happen, if we were to break down you might need it." A new bridge is being built right next to the current one. It should be opening in the next few months and the old one will be dismantled. My husband said we made history today, breaking down on the old bridge! Nicola, I thoroughly enjoyed this post! I love it when little things happen that make people reach out and help. We should all do it more. About a month ago a car broke down on Broadway (which is a major street in Vancouver) and the poor guy was trying to steer and push his car out of the rush hour traffic. I thought, I can't help him, I'm a woman. It was pouring rain and I was walking my dog. I tied the dog to the lamp post and just started pushing. All of a sudden the car was moving and the guy looked back and beamed at me and shouted THANKS. We managed to push the car to a side street and he was so grateful. Thank you Nicola for sharing "your adventure", it brightened my day! Thanks Carol. Yes, it certainly renewed my faith in my fellow humans!